Come prepared for training, matches and trips away from home with the Canterbury CCC Players Teamwear Backpack in Black and Grey, featuring storage for all of your essentials. 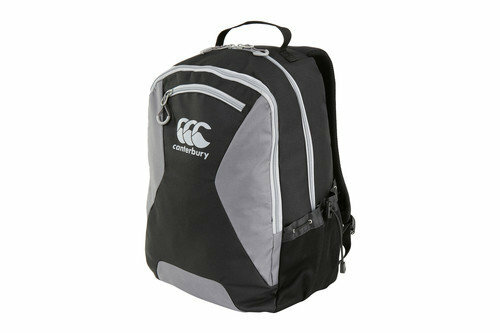 This rucksack from rugby clothing and equipment specialists Canterbury has plenty of storage space and pockets to organise and transport all of your belongings, whether that's your kit, school supplies or even stuff for work and is made from a strong polyester material for durability. Pockets included on this backpack feature on the front and the sides, with zip fastening for security. A mesh pocket also comes handy for storing a water bottle. Inside the bag a large sleeve is useful for keeping separate a laptop, books and other items. A handle at the top allows the bag to be hung up whilst adjustable shoulder straps with padding guarantees easy and comfortable transportation. A mesh padded lining at the rear of the bag allows it to rest comfortably against your back without causing you to sweat too much. Ideal for travelling up to matches and training, work, school or short away trips, store all your essentials securely in this Canterbury CCC Players Teamwear Backpack.